The Moriello family immigrated to America from Monte di Procida Italy in 1914 and settled in New York City for several years until they relocated to Middlehope. Here is where the family’s agricultural heritage has continued by farming fruits and vegetables for to the New York City market. As usual for many families at the time, both parents and all of the children worked the farm in order to pay the bills. The youngest of six brothers and sisters, Mike was a natural farmer. However, being the youngest he enjoyed an opportunity to continue with school and he graduated from New Paltz College as a teacher. Mike returned to his boyhood roots and in 1938 he left his teaching profession in order to pursue an entrepreneurial future in agriculture. He purchased a working fruit farm at a foreclosure sale in New Paltz. The original farm consisted of old apple trees, outdated machinery and its infrastructure was in a severe state of disrepair. Through hard work and economic prescience the farm greatly expanded to include extensive packing and storage facilities as well as numerous employees. In addition, peaches, cherries and pears were planted throughout the farm and direct sales of produce to the public was undertaken. In 1945 Mike asked his older brother Joe to join him on the farm. The two formed a company and christened it Moriello Brothers. Like their parents before them, Joe and his wife Betty taught their two sons and daughter the value of hard work. The eldest son, Tony followed in the family’s agricultural tradition and enrolled at Cornell University in 1954. Farmers had become accustomed to the vagaries of the weather with freezes, hailstorms, drought and other calamities being relatively commonplace. However, nothing had prepared the family for Mike’s death in 1955 while spraying the orchards in his plane. In addition to being a talented farmer, Mike had been extraordinarily civic minded. As a result of this the Town of New Paltz named the community pool in his honor. Owing to the death of Mike and the attendant impacts of the farm, Tony was forced to forego his final two years at Cornell in order to help save the business in 1957. Tony’s wife Sheila left her profession of teaching to assist with farm management and to raise their family. The resulting period from 1957 – 1980 was a time of great growth and specialization on the farm. Through the combined generational talents of father and son additional storages were built, packing facilities upgraded and additional orchards were planted. Apple sales were expanded to encompass virtually all of the continental United States as well as countries such as Canada, Chile, Argentina, Mexico, Iceland, England and Taiwan among others. Additional apple production has expanded during this period to encompass sales in excess of 100,000 boxes. In 1980 Tony and Sheila’s eldest son Michael enrolled at Cornell University. He graduated with a degree in pomology and economics. It was at Cornell that Michael cultivated his interest in direct marketing to the public. He and his childhood sweetheart Jean grew up a mile apart and were married in 1983. [Yes, in answer to the time-honored question, she was a cheerleader and he played football.] Jean was awarded a degree from Marist College in 1983 also but in Fashion Design and business. In 1985 a 125-year-old barn was relocated from the north end of the farm to its present location just past the SUNY New Paltz campus and turned into Apple Hill Farm. The name Apple Hill Farm was arrived at by a close friend of Jean and Mike’s after an exhaustive brainstorming session, which involved six pitchers of peach daiquiris, two guitars, great friends and a howling dog. Needless to say it was a long night. The period from 1985 to present has witnessed the growth of Apple Hill Farm from a sleepy little fruit stand to a place where a family can have a fun-filled outing. Apple Hill Farm affords visitors an opportunity to pick their own apples and pumpkins ride a haywagon and enjoy the spectacular views of the Shawangunk and Catskill Mountains. The farm’s location is only one mile from the village of New Paltz and its famous shopping and dining has helped to add to the Apple Hill Farm experience. Most of all through the continued support of our visitors, it has afforded Apple Hill Farm the opportunity to be a success and contribute to the quality of life which we enjoy in New Paltz. As a customer you are keeping agriculture viable in New York State and for that our family is appreciative. 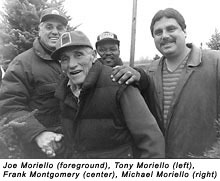 A note about Poppa Joe: Joe Moriello (Pop to everybody) died on May 8, 2000; he was 92 years young. His commitment to hard work, a fascination with weather and love of family has been an inspiration to all that he has touched. A true character, his comical visits to the market, bombshell pick up truck drives and folksy wisdom is sorely missed. He was a simple self made man whose world was uncluttered by cell phones, facsimiles and the internet. In the words of one fellow farmer at Pop’s services, “the world changed around him but Pop just went straight.” What a wonderful life of health, longevity and experience of the American Dream that he enjoyed. Pop and Mike had a saying… “When you work, work hard and when you play, play hard.” It is the philosophy that our family continues to live by. We hope that Apple Hill Farm can help inspire those who visit to do the same. Pick Your Own is 10am-5pm. Hayrides begin 9/22 and are weekends only. We close for the season on 10/28 at 4:00pm.